This dessert is a twist on the classic apple crumble. 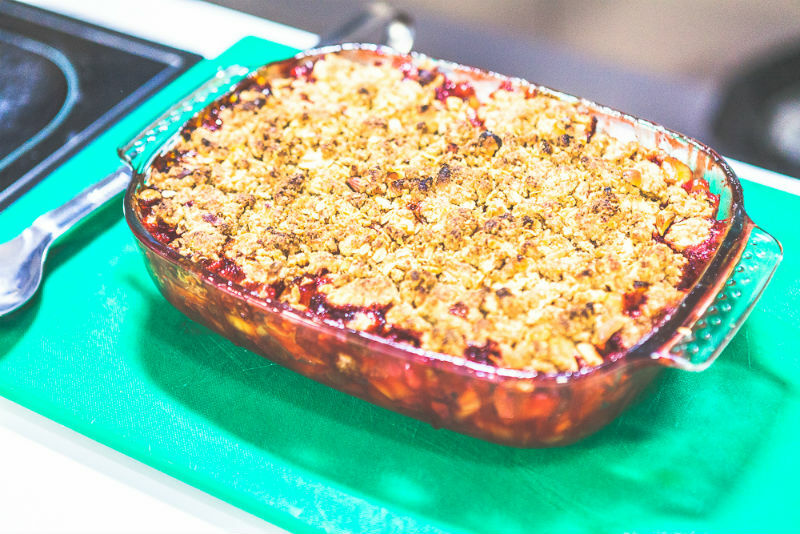 Apples are baked with strawberries under a delicious crumbly topping. Serve with some cream, custard or ice cream. 2. Put the chopped apples, lemon zest and sugar in saucepan. 3. Add lemon juice and sultanas and cook for 3-4 minutes. 4. Add the strawberries and cinnamon and cook for a further 2-3 minutes. 5. Put flour in a mixing bowl, rub in the butter until it resembles breadcrumbs (you can whiz flour and butter in food processor), and stir in the sugars, oats, cinnamon and nuts. 6. Scatter crumble on top of the fruit and bake for about 35-40 minutes until golden. 7. Serve warm with panna spray, ice cream or custard.